Reduces friction and wear in high-speed, high-temperature components like wheel bearings and electric motors. Keeps components running clean and trouble free for outstanding performance and long life. NLGI #1 grease has better mobility and is preferred for cold temperature and automatic pump systems. Formulated with high-viscosity ISO-460 synthetic base oils and a sophisticated additive package, providing unparalleled protection against wear. Ideal for leaky gear boxes in industrial and fleet applications, centralized lubrication systems and for use in applications that are difficult to service. An ultra-premium lubricant designed for high levels of protection in food and pharmaceutical industry equipment. Former USDA H-1 rated for incidental contact with food. Controls seal leakage. AMSOIL Synthetic Polymeric Off-Road Grease combines an over-based calcium-sulfonate complex thickener and proprietary synthetic polymeric technology to provide outstanding performance in heavy duty off-road applications. Delivers excellent wear protection and extreme-pressure performance over extended service intervals in medium- and heavy-duty applications. It combines select base oils, proprietary synthetic polymeric chemistry, an advanced additive package and a lithium-complex thickener for excellent impact resistance, reliable contaminant control and maximum longevity. AMSOIL Synthetic Multi-Purpose Grease is now available in a convenient 3-oz. cartridge size (GLC3P), designed for use with the new AMSOIL Grease Gun. 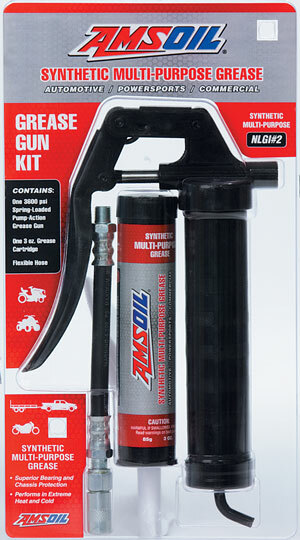 The Grease Gun Kit (GLCKT) includes a 3,600 psi spring-loaded grease gun, flexible hose and 3-oz. cartridge of Multi-Purpose Greasee 3-oz. cartridges are also available in packs of three. Copyright © 2006 - 2017 Fisher Resource Solutions® All rights reserved.